Waffle Flower Crafts Rock My World and a giveaway! 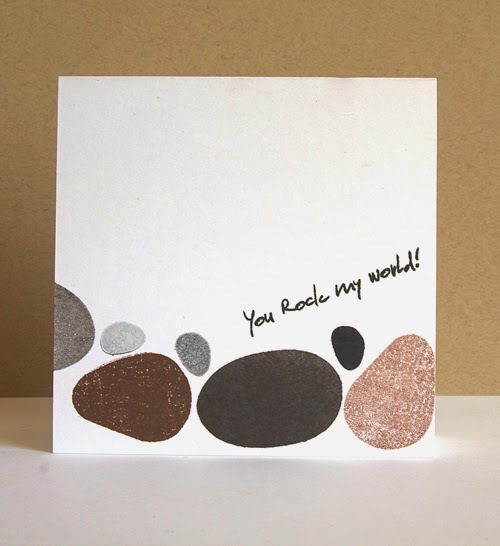 Sweet Nina Yang from Waffle Flower sent me the Rock My World stamp set to review. Now we all know that I am a stamp snob. It's a fact and I am not ashamed of it. So let's get started. Ease of Use: Obviously these are clear stamps and so they are super easy to use. You know exactly where the image and or sentiment is going on your project. Quality: Now here is where I get picky in the stamp category. These stamps are of great quality and should last you a very long time if taken care of properly. Usefulness: Now keep in mind this is my opinion and completely subjective to that. I really didn't see much use to this stamp set. I mean it is cute and all, but I can't see using this over and over again. Once or twice maybe. Still cute though. Cost effectiveness: At the price point of $15.99, it's about par for comparable stamps from other manufacturers. - I liked the quality of the stamps. They stamped a good clear image. - They are a fun quirky set. -The theme of the stamp is just not that versatile. With this card I put down some Angel Pink ink by Memento down first so it would show through the rock stamp to give it that chalk look. 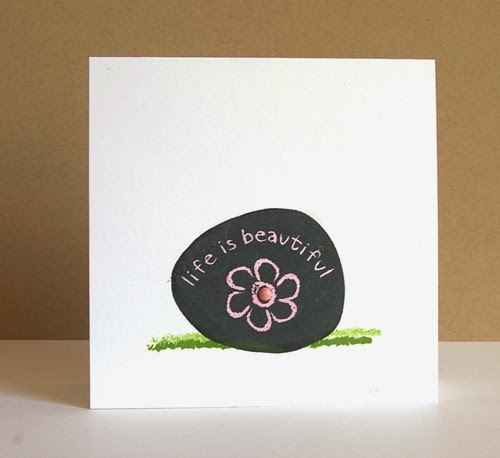 For this card I did a lot of 2nd generation stamping to give it the grainy, mineral look to the rocks. What do YOU think? Is this a stamp set you would use? 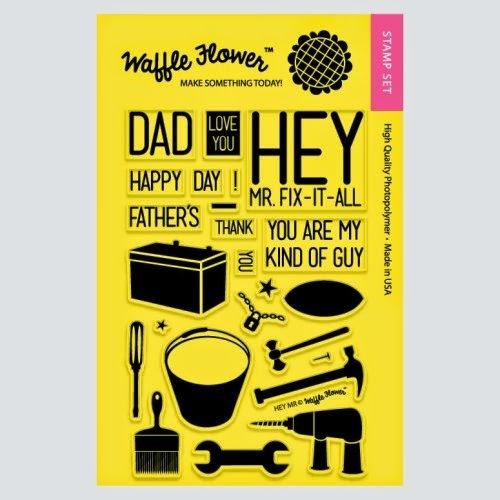 Do you have any Waffle Flower stamp sets? Leave a comment by midnight EST on Wednesday to be entered to win the Hey Mr Stamp set. US Residents only and please leave a way that you can be contacted! Thanks!! 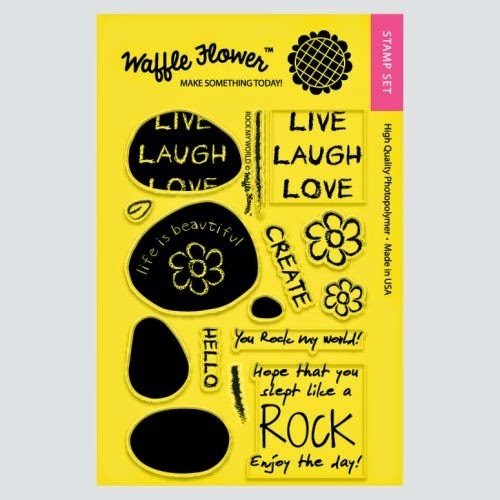 I honestly hadn't heard of Waffle Flowers before but the whole concept of a stamp set related to rocks makes me chuckle- cute and unique. I don't know how many times I would use it either but it sure is cute with the rocks. I like what you did with it. I agree with you on the versatility of this set and that it is a cute and fun set. Thanks! I had been wondering about the quality of these - great to hear they are good! Love what you did with the rock set!!! I do see how the themes are quite specific. You used themw ell. I've never heard of this company but I think their stamps are really cute! I don't know how often I would use this set, but might like to use it for cards for my niece. 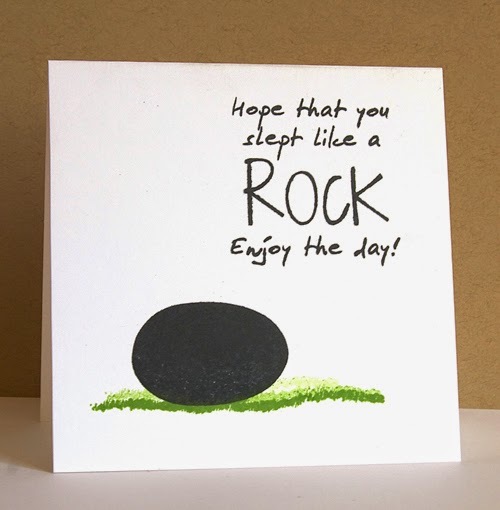 She likes to paint on rocks, so a card with that theme would be perfect for her. I like the sentiments that go with this set. I'm not usually into the sketchy look, but I like these.